Interactive timeline map of the Napoleonic battles. "Napoleonic Wars Game" is a small knowledge level game, to advance in historical progression of napoleonic war territories. Time scale of Napoleomic Wars. Fun educational game about the key battles of Napoleon. Interactive Napoleonic wars maps. History learning game, suitable for online lessons and interactive classes. Free online game for desktop computers, laptops and tablets, which may be played in the web browser. Minute to win it game. History maps game. 1800 - June 14: Battle of Marengo. 1801 - July 8: Battle of Algeciras. 1805 - October 19: Battle of Ulm. 1806 - October 14: Battle of Jena and Battle of Auerstadt. 1807 - February 8: Battle of Eylau. 1809 - July 5–6: Battle of Wagram. 1810 - April 1: Napoleon officially marries Marie Louise, Duchess of Parma. 1812 - September 7: Battle of Borodino. 1813 - October 16–19: Battle of Leipzig defeat. Battle of the Nations. 1814 - March 30–31: Battle of Paris defeat. 1815 - June 18: Battle of Waterloo defeat. How to play Napoleonic Wars Game. The main picture shows the simple map and year of France territory. There are also three arrows with possible movement to one important battle from Napoleonic wars for this year. When you inspect the battle outcome, you will see exact date of the battle and soldier statistics. 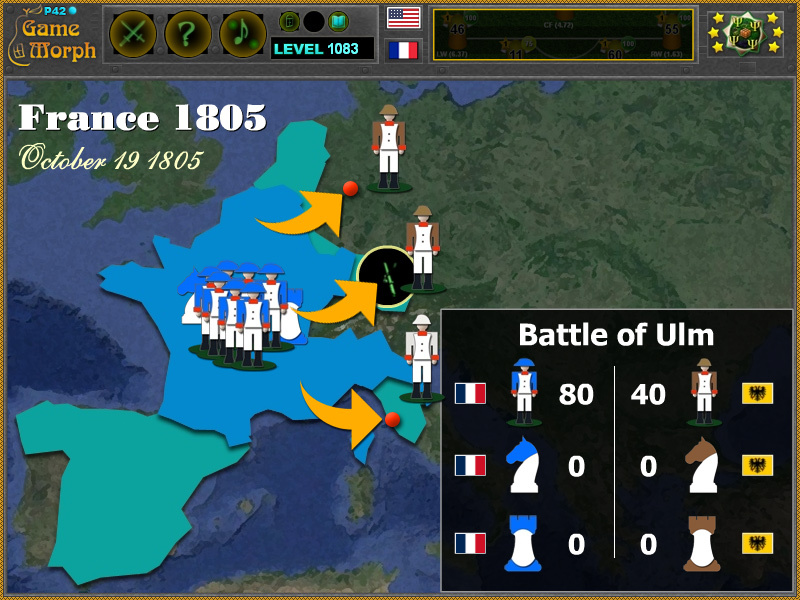 Be sure that the troops of Napoleon are more than the opposing troops and then click the fight button. A short battle result will decide if you continue to the next year and next key battle. Know at least 3 battles from Napoleonic wars and get +1 Knowledge Level. 2. 1800 - June 14: Battle of Marengo. 3. 1801 - July 8: Battle of Algeciras. 4. 1805 - October 19: Battle of Ulm. 5. 1806 - October 14: Battle of Jena and Battle of Auerstadt. 6. 1807 - February 8: Battle of Eylau. 7. 1809 - July 5–6: Battle of Wagram. 8. 1810 - April 1: Napoleon officially marries Marie Louise, Duchess of Parma. 9. 1812 - September 7: Battle of Borodino. 10. 1813 - October 16–19: Battle of Leipzig defeat. Battle of the Nations. 11. 1814 - March 30–31: Battle of Paris defeat. 12. 1815 - June 18: Battle of Waterloo defeat. Labels: History Games , Map Games , History Quests , Learning Games , Education Games , Free Online Games.